Say Your Say On Our Pictures,Videos,Jokes etc. Dear valued friends and readers please use this section to comment on the pictures, jokes, videos we put up for your entertainment on a daily basis. If you feel you don’t like or do like our pictures, videos or even our weak but clean jokes you can add your view here. The real reason for this comment section is that readers have been sending us so many emails regarding our added pictures and videos that we thought it would be great if you had a place to comment on them. So here it is, please just keep your comments clean as this is a family friendly news site. We have no problem if you feel the need to criticize us, as we would welcome that but please just do it without using any crazy 4 letter words etc. a marvelous post and a all round enjoyable news articles (I also love the theme/design), I don’t have time to go through it all at the minute but I have book-marked it and also added your RSS feeds, so when I have time I will be back to read more, Please do keep up the fantastic job. ӏ think the Admin օf thiѕ website is in fact working hard on this site, please contact me I want to invest with this site. Great article on Joel Smoker. It’s attention getting, informative, and promotional. WHISNEWS21 has it all covered! Just To Say Thank You For Everyone That Was Involve In Doing Miller Road. Thank you Tattoo Billy for people like you and for your video song about the situation in South Africa. One wrong cannot fix another wrong. May you and your group succeed to open the worlds eyes about the conditions in our beloved country. Thank you Tattoo Billy for your videosong about us here in South Africa. We need people like you to open the worlds eyes. May you and your group flourish in the blessings of our Great Creator. The jokes and featured videos are something I check out every day. It is quite often the only time I get to laugh the whole day. Wouldn’t know what to do without it. Thank you John, we always try our best, which is probably really the best we can, to make your day a little brighter and informative, we know that we cannot always get it right but in our small way we do try. Please comment here if you enjoyed one of our jokes, thought out picture for the day was great or our video choice for the day was bad. 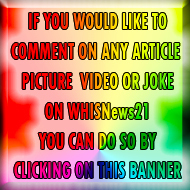 Infact you can comment here about anything you want about WHISNews21. It is your choice to do so.